Past/root: Lady of the New Buds - nurture tenderness. PAST / root: Lady of the New Buds - nurture tenderness. The Lady of the New Buds speaks of tending the new; seeds, ideas, children. Keeping them cared for, protected so that they can grow strong. She reminds you to accept that not all will know the work you've put in, to yield such a bountyful garden, but also to appreciate your own effort and to accept praise when you get. This is where you have been. 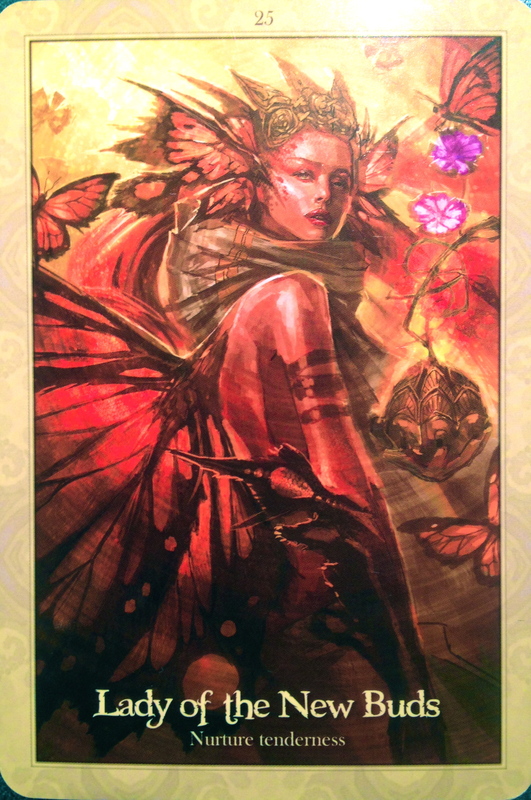 The dragonfae wants to remind you that growth is change - and that stagnation is death. It is time to allow what you have tended to, to show itself viable. NOW/action: Dragonfae of Rebirth - Whole again. This is the card of accepting and learning from the dark shadows, feelings of hopelessness and disconnect, even desires to harm oneself. 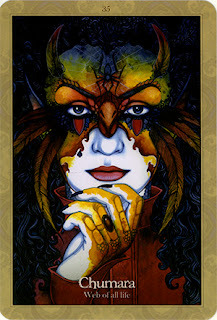 The Dragonfae want you to trust in also in the darkness, for there is the wisdom of knowledge you have yet to learn. The old you, fractions in your soul, is ready to 'die' metaphorically, and change into a new you - a whole you where light and dark are equally valued and balanced. These Dragonfae are of spiritual ancestry and of bloodline ancestry; exploring both at this time can be important. Are there family relations you need to "make contact and some kind of peace with"? Reconnect with aspects of yourself that you have disowned. Drum circles and shamanic rituals can help with exporing the spiritual ancestry. This is a very strong card for allowing profound change. Not in an easy, way but by integrating all of your aspects and valuing the dark and uncomfortable feelings fully. FUTURE/ outcome: Chumara - Web of all life. Chumara speaks of the masks that we all wear, and what lies beyond - your self. She says that it is time to let your face show, keep your protections, your shield for another time, when you might need her, but let her be just that - protection - not your identity. So, the time will come when your new self gradually more can be shown to your surroundings, first in safe environments and gradually stay your true self more and more. She speaks of new family, and meaningful connections. Chumara weaves a web across dimensions and I get the sense that you will have great access to communication across and beyond this dimension. She wants us to consider not only Gaia as our home but the Universe, and to look beyond our short term economic thinking when caring for Earth and the Universe. The Lady of the New Buds speaks: “See how my garden has grown about me? See how my children, the darling buds, clamor for my attention? They cry at night and can be so touchy during the day I must shelter them from harshness and keep them in a safe place, til they are strong enough to branch out… even then, my watchful eye will look out for their care. You see, so may people see the beauty, and do not understand where it sprang from; the rich loamy soil. The sweet water poured from the Water-Dragonfae into this earth, the minerals of the natural realms, the light of the Sun and the shining sweetness of the crystal moon have all anointed my garden with their blessings”. And then there is me. So many see my garden, and wonder at it, but they do not see the work and the care that has preceded my domain. Its beauty is a result of love, care, natural growth and attention to each and every one of its inhabitants. When your growth and attention to each and every one of its inhabitants. When your growth appears around you, from the seeds you have planted, take time to tend this garden. Enlist the assistance of like-minded souls, and just as you would not feed these tender buds poisons and pollutants, do not feed your ideas the opinions and energies of those who are not in integrity. Stay true to the vision of your creation and truly take a little tie each day to tend this garden, be it of love, ideas, little ones or creative endeavors, until they are robust and begin to grow into their own energy. For now, it is the tender time, the time when the buds are at most risk from the frost of rejection, the poison of judgement, and the choke of cruelty. Be vigilant, and you too will have a garden for all to enjoy and love. Many will feel you are fortunate indeed to have created such a beautiful Eden, but they will not see the care you have taken to grow this. But I have seen. I have seen it all”. Divinatory Meanings: “An affinity with flowers and gardens. Projects need tending. Care every day for small matters, and the large will care for themselves. Resisting change is resisting the life force itself. Look at everything in nature. The seed does not remain a seed. The seedling grows. The tree seems unrelated to its origins, but at the moment, by holding on tight to the person you believe you must be, you are running the risk of denying your own life force. Change is positive. Stasis, as a resting point, can work well. As a life choice, it can be a kind of slow death”. The emergence will come at the right time, because the bud will be forced to flower at some stage – do not allow yourself to wither in the bud. Divine guidance needs practical application and work. Action teamed with inspiration will create a beautiful, bountiful paradise. Work hard at what it is you love." 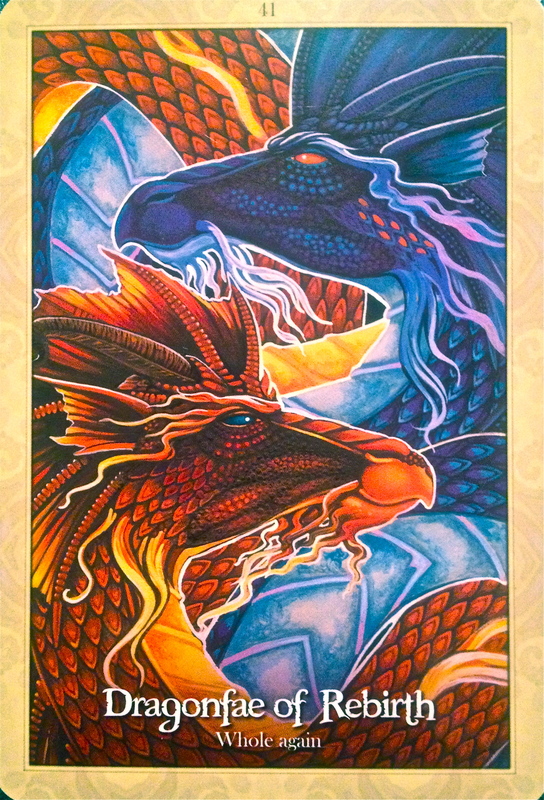 Divinatory Meanings: “The Dragonfae of rebirth are working with you to heal a soul fracture for fissure that has developed through your Self being separate to your true self. Your inner knowledge is not being expressed externally. Healing circles, drum circles, shamanic practice ans working to heal the karmic impact of your bloodline and spiritual line will benefit when this beautiful card reveals its energies to you. Working with others in groups or workshop environments will be of great benefit, as will journeying and going deep within. Connect, and through connection, you will heal. Make contact and some kind of peace with family and your own past. Re-integrate aspects of yourself that you have disowned, and always know that we walk in shadows and light… acknowledging only one aspect of life is never whole, nor healthy. Be balanced and be free.